I am not used to long breaks or holidays, especially not ones that involve extended stays at home. But the Christmas break just passed saw me at home for the best part of two weeks. It was less than twenty-four hours before I started getting cabin fever desperately trying to find things to occupy me. I was further hampered by the need to rest my back after minor surgery so the few days running up to Christmas saw me mostly on the sofa surrounded by cook books with my laptop and a notebook for researching recipes. I found lots and lots though I don't suppose that is any surprise, food-enthusiastics have grasped new technologies with both hands and share recipes and experiences around the world. I did get very distracted trying to find out how to make vietnamese spring roll pancakes (I've not sussed that out yet) which then lead on to glutinous rice dumplings and then ... well, you know how it is. Suddenly you have encircled the globe three times and completely forgotten what you started out looking for. I have been thinking about the ultimate orange cake for some time. I want to capture the zingy essential flavour of orange zest in a gluten free cake, with a light texture without any icing. Of course, it also needs to be low fat and preferably sugar free too. I am still working on this holy-grail of cakes but I thought I would share this recipe with you as it has definitely grown on me over the past couple of weeks. The recipe is originally found here, on the Big Hospitality website and was created by Christine Bailey who was the joint winner of the Gluten-free Chef of the Year. This is a variation of the theme of "take a whole orange, puree it and fold puree into polenta-based recipe". I like this recipe because Christine has addressed a couple of points that I always see as negatives with this style of recipe. By zesting the orange and then peeling it, discarding the white pith, you omit those bitter notes which can overpower the zesty flavour. Then by adding a gluten-free flour blend to the polenta she has also lightening the consistency of the cake which is great. 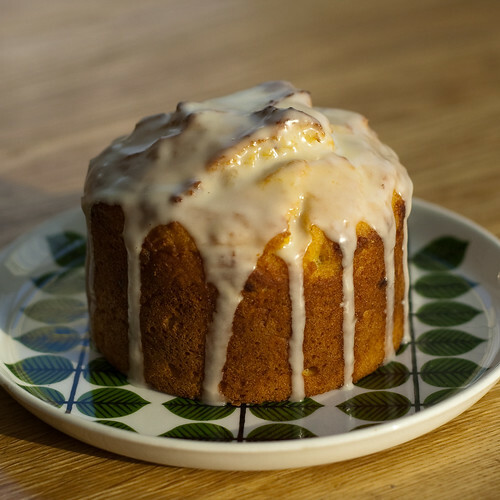 This is a sugar-free recipe and that is worth bearing in mind before you take your first bite, even with the added honey, this cake is not sweet. You can address that with the type of apricots you buy. I used run-of-the-mill sulphured supermarket ones which added texture but no real sweetness to the recipe. If you can choose unsulphured, organic apricots, those dark brown, unattractive fruits that tend to get ignored for their bright orange, less flavoursome counterparts (squeeze the pack and make sure they are really squidgy if you can) then you will get a far richer sweeter flavour that will compliment this recipe perfectly. I have copied the recipe just as Christine has written it though I made mine with dairy free margarine. My mixture curdled completely in the food processor but this makes no difference to the finished cake though, so don't be concerned if it happens to you too. Instead of making one cake I split the mix into 2 x 5" round tins and 3 greased and flour dusted dariole molds. The little ones took 15 minutes to bake and the 5" ones took 21 minutes. I glazed one of the 5" cakes with a fresh orange juice and icing sugar (5 tsp icing sugar to 1 tbsp orange juice, I think) to serve for tea and have eaten the other, unglazed cakes for breakfast and they have been lovely! Place the orange zest and oranges in a food processor and process to form a thick puree. Add the apricots, butter, eggs and honey and process again until smooth. Place the flour, polenta and baking powder in a bowl. Add the puree and beat well. Place in the cake tin and bake in the oven for 30 minutes until a skewer placed in the centre comes out clean. Leave to cool in the tin for 5 minutes then transfer to a wire rack. * these are my annotations but otherwise the recipe and method are exactly as Christine's original recipe. Labels: gluten free, orange and apricot cake, sugar free, wheat free. This sounds like a really great post Christmas excess cake. Like you I've rather doubted using the whole orange in cakes, so haven't actually tried this method before. I'd go for the unsulphured apricots everytime - not so pretty but so much tastier and better for you too. Wish I could make more cakes, but I'll just eat them. This picture looks realy yummy! That looks very delicious. I love to see that runny glaze. It would be great with a hot cup of tea in this cold weather.